In the recent months, two car share programs have expanded in Seattle to allow one way trips to and from Seatac International Airport. Which one should you take? Zipcar or ReachNow to Seatac Airport? UPDATE: It seems that Zipcar has discontinued their one-way rentals to/from SeaTac Airport. Zipcar was the first car share program to enter the airport game. Introduced in early 2016, one-way trips allow you to start your trip at one Zipcar location and end it at another. You can read my take on Zipcar here. Unlike standard Zipcar reservations, you can only reserve a one-way trip for a (nearly) immediate time slot. For example, if I open my Zipcar app at 10:17 wanting to go to the airport, the only time slot available will be for starting at 10:30. If I want to leave at 11:00, I will need to wait until closer to that time. You select your pick up location and it will look for a designated one-way Zipcar that is near by. Note that not all Zipcars are available for one-way trips. You may have to walk some distance. Departure: When you get to Seatac Airport, you have to park your car at the WallyPark Premium Parking Garage located at 18612 International Blvd. Designated Zipcar spaces are located on Level 1. You park, leave the WallyPark ticket on the dash, and lock the car. A shuttle takes you to the airport terminal. Arrival: If you are picking up the Zipcar from the airport; you go to Level 3 of the parking garage where the courtesy shuttles are. Look for the WallyPark Premium shuttle at Island 1 or 3. I suggest making your reservation before getting on the shuttle as there may not be a Zipcar available for you to reserve. 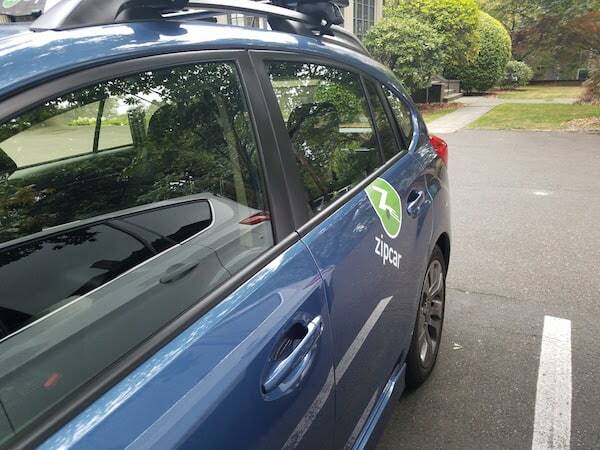 Cost: Most of the one-way Zipcars can be rented for $4.50/30 minutes. If you want to keep it for longer, you can. In Seattle the tax adds about $0.75/30 minutes. So if there is no traffic, it can cost as little as $5.25 for a trip to/from the airport. I can’t imagine it going much over $10.50 for the trip. Driving in to the city from the airport you have to select your destination during your reservation process. Again, not all Zipcar parking spots are available for one-way trips. On my recent trip the closest spot to my home was about 5 blocks away. ReachNow is the new kid on the block when it comes to car share. To learn more about their model you can read my review here. A few weeks ago they introduced one-way trips to/from Seatac. Typically ReachNow has a home area of within the city limits of Seattle. Seatac is the one exception to this rule. Just like Zipcar, ReachNow uses the WallyPark Premium Parking Garage with dedicated spaces on Level 2. Departure: Unlike Zipcar, you can hop in ANY ReachNow car in Seattle, drive it to WallyPark and end your trip. ReachNow limits your reservations to 30 minutes prior to when you are going to use it. This means if you want to leave at 11:00, you can’t start looking for cars in your area until 10:30. ReachNow has a lot more reserved spaces in the WallyPark garage. When I visited last week there were 15+ ReachNow cars available for rental. Arrival: The process is almost identical to Zipcar when you want to car from Seatac. Open your app, make a reservation, hop on the WallyPark shuttle and you are good to go. Cost: The cost of ReachNow is higher than Zipcar. There is a $5 charge for beginning or ending your trip at the WallyPark garage. This is in addition to the $1 “Shared Asset Fee” for any ReachNow trip. The cost per minute will be $0.49/minute in September (currently it is $0.41/minute) plus tax. My recent 26 minute trip from the airport ran about $19; or nearly 4x more than Zipcar. For a limited time they are offering a $5 promo code good for a future trip when you start/end your trip at Seatac. I think if they are going to stay competitive with Zipcar, they will need to drop the $5 charge. However, that higher cost comes with added convenience. When taking a ReachNow car from Seatac to Seattle, you can drop off the car in any legal, on street parking spot. When I took it recently, I was able to find a spot directly in front of my building. No needing to haul my luggage 5 blocks. I also am guessing there will be more ReachNow cars than Zipcar available at Seatac based on the number of reserved spaces. Recently I tried to take a Zipcar from the airport but none were available. 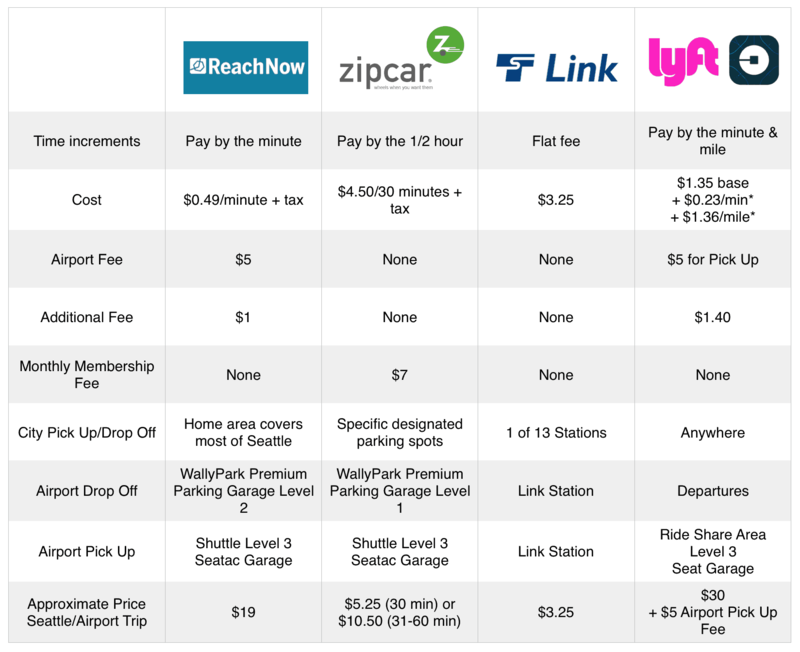 So how do Zipcar and ReachNow compare to other options to/from the airport? 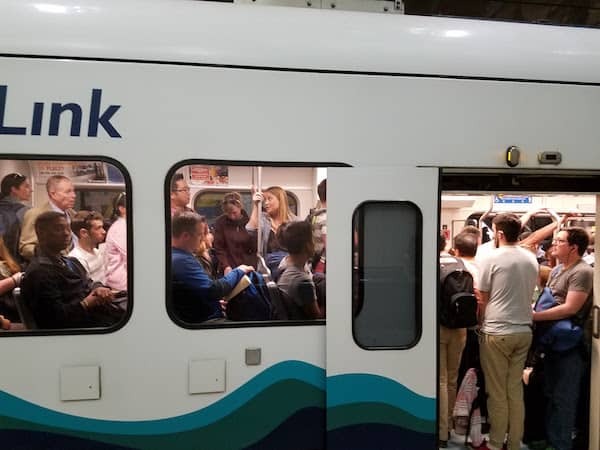 The least costly option is going to be Link Light Rail. For $2.75-$3.25 (depending on distance) you can ride from the airport to downtown Seattle, Capitol Hill, UW, or the stadiums. Depending on traffic on I-5, this may or may not be slower than driving. While you don’t have to take a shuttle from the terminal to the Link station, you do have a bit of a walk to get there. Uber and Lyft now also offer airport pick-up and drop-off. Lyft and Uber both charge a mandated $5 Seatac airport pick up fee on top of their other fees (there is no fee to be dropped off at Seatac). My most recent Lyft ride from Seatac to my home cost me $35.84 plus tip. UberX cost me $28.17 to get to the airport (would have been $5 more coming from the airport). The benefit of Lyft and Uber is that you don’t have to take a shuttle. The car will drop you off at the departure level and pick you up in the garage (not far from the WallyPark shuttle pick up). And for those folks that don’t live in Seattle or near a Zipcar parking spot, Lyft and Uber will be the only options. So who wins; Zipcar or ReachNow to Seatac Airport? Zipcar is cheaper but ReachNow is slightly more convenient?